PRODUCT: 2.125" OD 90 Degree Side-Outlet Roof Drain, 10" Poly Dome, Clamp Ring, 14" Diameter Copper Flange, Copper Pipe Outlet. Price/Each. DESCRIPTION: New Installation drain assembly with 90 degree copper pipe outlet, clamp ring and Polyethylene drain dome. 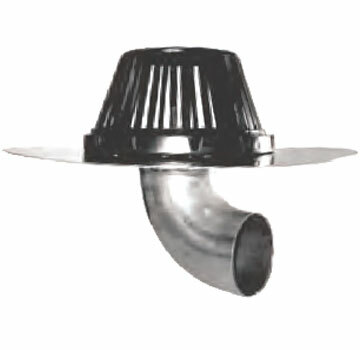 10" diameter high-profile polyethylene drain dome / strainer dome. 14" diameter all copper flange. Copper pipe outlet (not threaded).